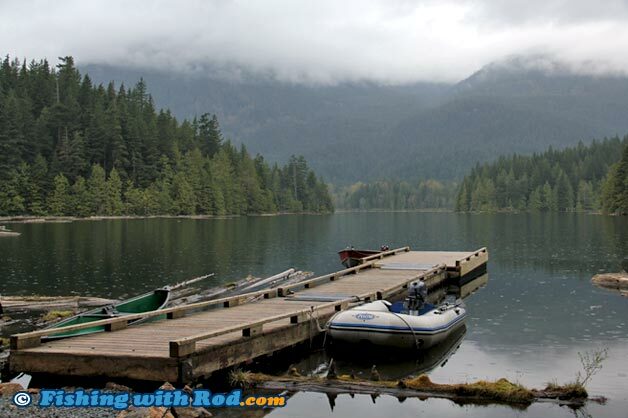 At the Southeastern end of Harrison Lake near Harrison Mills sits a peaceful lake that is popular for anglers and families. Weaver Lake offers very productive rainbow trout fishing and camping in a wild setting. This is an ideal spot for Vancouver anglers who enjoy doing day or weekend trips if time is limited. Weaver Lake has many small bays and islands where you can tuck your boat away and fish peacefully all day long. To get to Weaver Lake from Vancouver, turn onto Morris Valley Road from Highway 7 in Harrison Mills. From the turnoff from Highway 7 to Weaver Lake, it is approximately 11km. Once you pass the Weaver Creek Spawning Channel, the road turns into a forest service road. Follow the signs to the lake. The gravel road can be steep and muddy at places, so a SUV or truck is more suitable for this trip. When you reach the lake, please park at the day-use area if you are only there to fish without camping. The boat ramp is single lane so only one boat can be launched at a time. Freshwater Fisheries Society of BC stocks Weaver Lake with blackwater rainbow trout each year. These fish are stocked at the yearling size (50g or less) and they eventually grow to 14 inches long. They are diploid, so spawning and natural recruitment also occur in the lake. The fishing season starts in March, but best fishing takes place from April to the summer months. April and May can be excellent as the fishing is hot while the recreational site is lightly used. In July and August, camping becomes more popular among families so it can be very busy at times. Fishing in September and October can also be quite productive like spring, before water cools down for the winter months. Rainbow trout found in Weaver Lake range between 8 and 14 inches long. Occasionally a fish up to 16 inches can be caught. Because these fish are not particularly big, a light setup is more enjoyable for this fishery. If you prefer fishing with a spinning setup, a spinning rod rated between 2 and 6lb or less is best. Use the smallest spinning reel that you can find and spool it with 4lb test main line. To catch them consistently, try float fishing with bait such as single eggs, shrimp, krill or dew worm. Bait it on a #4 or #6 hook and hook-ups are almost guaranteed. Look for small bays where fish often take refuge. Once you locate a school of fish, be sure to cast to the same spot repeatedly so you can have consistent bites. Trolling is another common technique used at Weaver Lake. You can either troll with a small spoon or spinner, or a small fly (#12 leech patterns). If you are fly fishing exclusively, try using chironomids under an indicator or look for surface activities when hatches are happening. A dry fly can outfish all other technique if feeding is heavy on the surface. The lake's depth is up to 100ft at certain spots, but most fishing takes place in waters shallower than 40ft. Unless you are trolling, make sure your boat has a double anchor system so you can remain stationary at a spot. This lake can be quite windy at times, so being able to anchor is pretty important. Shore fishing can be done but access is minimal. The floating dock at the campsites has direct access to pretty deep spots. Try casting a small spinner such as a Rooster Tail from the dock to lure a chase by hungry trout. Some anglers also fish on nearby log booms, but this should only be done with extreme care. Weaver Lake is located in Region 2 in the British Columbia freshwater fishing regulations. There is a speed restriction for boats and no fishing applies to some sections, so please read the regulations carefully. If you are only visiting the lake for the day, please note the gate closure time at the campsite. This is a popular camping area, so please respect other users by keeping your noise down, ensuring all garbage are picked up before leaving and avoiding taking up too much time at the boat launch. It is a big lake with many fishing spots so please give other boats plenty of space.